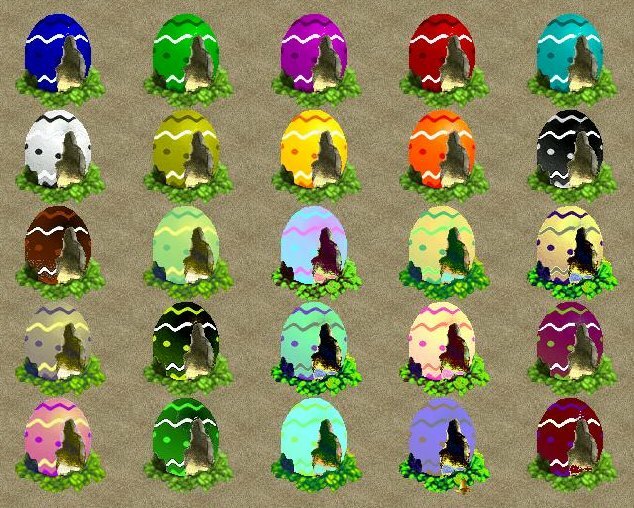 Description: 25 Recolours of devona's shelter. Your animals will enjoy taking refuge in these Easter egg shelters. Note: When a purchase menu in ZT has more than 1 object using the same messages, you have to pay attention when selecting one of the later ones of those objects in the purchase menu. If you select one of them and then rotate the icons in the purchase menu or close and reopen the purchase menu or ZT checks if there are new things to unlock (which is usually at the start of certain game months), ZT will change the selection in the purchase menu to the first one of the objects using the same messages. This can sometimes be confusing. But this is a small inconvenience so that we do not run out of IDs faster than needed. In this case, all of these shelters are using the same "Fancy Shelter" messages.